Seen Through a Glass: Craft beer growth accelerates! Hey, it's a good day when I see news like this. Not only is craft beer continuing to grow, it's accelerating. 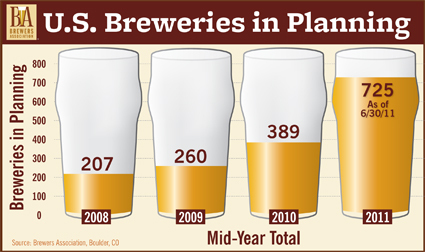 Check it out, and check out the graphic: 725 breweries currently in planning stages! Major part of this is accessibility; people can find and buy craft beer because bars and restaurants (and wholesalers) are finally offering it, and newspapers and magazines are treating it like food or wine, instead of some goofy clown story (Hyuk, hyuk, lookit these beers with the funny names, you drink 'em with your pinky out!). That's your efforts, people: you made them get your favorite beer, you bought enough to make them pay attention. Congratulations! 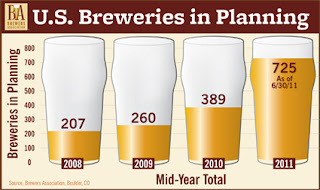 Boulder, CO • August 8, 2011 - The Brewers Association, the trade association representing the majority of U.S. brewing companies, has released strong mid-year numbers for America's small and independent craft brewers. Dollar sales were up 15 percent in the first half of 2011, excluding brewers who left the craft segment in 2010*. Volume of craft brewed beer sold grew 14 percent for the first six months in 2011, compared to 9 percent growth in the first half of 2010. *Goose Island, for one, which is ridiculous in my opinion: the beer tastes the same, regardless of who's making it. Is craft beer a drink, or merely a business? If I were a brewer, I might have a different opinion, but I'm a drinker. Isn't it funny how a week can change things. I wonder now how many of the 750 breweries in 'Planning' phase will actually succeed in setting up shop. Will banks now lend to these businesses? Like you I want to see growth in the industry, but also how much more of the same types are we going to see? like your comment on Goose Island I feel many breweries put out 'blah' beer. Though now back in Australia its more 'blah' beer. I feel we will see a trend in convergence between breweries in the coming years, especially as the US is going through tough economic times. Lew, the figures I last saw for 2010 said, if I have it right, that craft beer volume was 5% of total sales. I understand the number is a couple of points higher for the dollar value. What do you project for this year? Do you feel 5% is a lot after some 30 years of trying? I was hopeful 30 years ago it would be more like 50% by now. However, one thing that seems assured is the respect and visibility craft beer has in the wider culture. It`s been some time since fine beer was regarded by taste-makers as an eccentric pastime. Craft beer, i.e., great beer, is here to stay. Maybe one can make an analogy to the best wine made today, that (presumably - I drink little wine) the really good stuff is only a small part of the market. Gary, I look at imports, the Heinekens and Coronas. In 1985, they were about 1.5% of the US beer market. They exploded to about 14% by 2001. Craft is taking a bit longer, but it's much more different. Keep in mind just how much 1% of that market is! Craft's growth is accelerating, but at 5% it will take growth of 20% to hit 6%...at least 2 years. Technically, the Brewers Association booted Goose Island from their "craft" designation back when the partially A-B-owned CBA controlled 40% of GI, so they're not one of the breweries that "left" the segment in 2010. Kona, bought outright by CBA (which previously owned 20%)is one. The IBU - Magic Hat/Pyramid combo bought by NAB is another. I think your US import market share of 1.5% for the mid-1980's is a bit low, it was just over 4% in '85, just as Corona was taking off (it jumped from the #10 import to the #5 that year). 1.5% was probably what it was the decade before that. I often make the point that REAL growth and significant changes in the US beer market during the "craft era" - say, starting in the late 1970's- has been imports which now account for around 13% of the US market (in particular the Mexican brands which are basically all US-style adjunct beers only they cost more) and the rise and dominance of "light beer"- now over 50% of the US market. The #1 US beer, Bud Light, didn't even exist when the first US craft beers hit the market. Lew, thanks for that. I've wondered about the spike in imports over the period you mention. Does it portend a shift ultimately to craft beers, or does it represent another form of old-style American production? I think perhaps it splits in that Corona and similar beers can be viewed as similar in style to mass-produced American light lagers. Whereas Heineken, say, being an all-malt beer with some decent flavour, might be a gateway to craft beers. It could take two years to get to 6% nationally, we'll have to see. Maybe the change can come faster, i.e., if a critical mass is developing. Just wait till October when Bud and Millercoors raise their prices again.The difference of a 30-pack of Bud or Miller cans and a case of Yards Phila Pale ale may only be a few dollors.If you had the choice what would you drink,good buy 30packs. "If you had the choice what would you drink,good buy 30packs." Steven, I'm thinking he may have meant "Goodbye, 30 packs!" Thanks, JK: good to have you back-stopping me (and keeping me honest)! if i could have a dollar from all people who drink light beer and corona who say they taste ok but i can drink a lot of them. With prices for grain,sugar,malts dropping like the stock market the only price increases crafts will take are from the wholesalers,who are being squezed from the breweries.Bud,,Millercoors who are selling less beer but are making more money,they need to make up for it some way.The breweries want to kill the 30-packs anyway have you seened the prices for 24 pack cans at $14.99 compared to $22.99 to $24.99 for a 30pack,thats without the price increase next month. Bring on the Pumpkin beers Pumpkin beers its your time of year. Grain, sugar, and malt prices really don't drive the price of beer. When you buy a 6 pack you're mostly paying the retailer and distributor for their costs/profit, and the brewer for packaging. Agricultural materials and the brewers' other costs/profit are further down the list. Skills you need like In-Bev when you are not gaining market share at a fast pace.When you are gaining share,thats all you need. You have relatively low pricing,but as long as your gaining share thats all your need.But once you stop gaining share,you had better have cost-cutting and pricing as lets raise them and focus skills and these skills InBev brings. Oktoberfest in Bucks County? I'm there!